Leather Junction Bring Exotic Gift Box For You. It's An Ideal Gift For Marriage Ceremony, Anniversary, Birthday, Corporate Gifts, Diwali, Christmas and also many other occasion. It's An Exclusive 5 in 1 Combo Set Of Stylish Wallet, Belt, Card Holder, Key Ring & Pen. Beautifully Packaged in Leather Junction Gift Box. Must have in your accessory collection. We are a leading business organization, which brings forth Leather Gift Box for its valued customers. This leather gift box is made from cow ndm /pdm can be used for gifting items like jewelry. This is customized design can be made according to the customer specification. 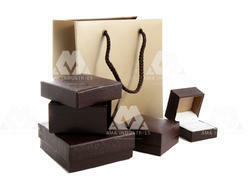 Recognized in the industry as a prominent firm, we are engaged in offering Leather Gift Box. Our team of talented and creative designers manufactures the offered boxes in adherence to the industry set guidelines with the help of modern tools and machines. Also, these boxes are packed and dispatched timely. Our firm is a leading name, involved in providing a comprehensive series of 6 IN 1 (BLACK CROCO). Presented range is immensely admired owing to their top performance and reasonable rates.